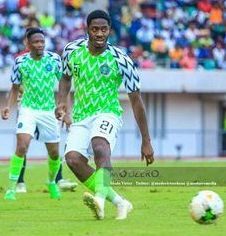 Chelsea loanee Ola Aina has withdrawn from the Nigeria squad ahead of upcoming games against Seychelles and Egypt citing injury, the Nigeria Football Federation announced on Sunday evening. It is not yet known what kind of injury the wing-back suffered as he started and played for 92 minutes, including injury time, in Torino's 3-2 loss to Bologna on Saturday night. Torino confirmed after yesterday's game at Stadio Olimpico Grande Torino that Aina has been summoned by the Nigerian Federation for international matches on Friday 22 March and Tuesday 26 March. Despite 22 players available for selection, manager Gernot Rohr and the NFF have called up Ndifreke Effiong of Akwa United as replacement for the 22-year-old defender. Effiong joins Valentine Ozornwafor, Ikouwem Udo (both Enyimba) and Paul Onuachu (Midtjylland) as the uncapped players in the squad. The 20-year-old Effiong was an influential member of the Nigeria squad that won the 2015 U23 Africa Cup of Nations and represented the Dream Team at the 2016 Olympic Games in Brazil.